The debate that is continuing to rage is whether this is a bear market rally or a bull market. Although I find it interesting that the topic has somewhat shifted. Now it is whether this is a secular bull market or a cyclical. To throw a log on the fire, here is some interesting historical data. If you were to take the relative distance of the Dow to its simple long term average and watched for when it fell at least 10% below it and then subsequently, rose 10% above it, you would have a very lazy but incredibly profitable way to time the market. We reviewed something close to this simple system recently. Instead of waiting for an index’s price to drop and then regain composure, we simply looked at the extremes. Or how far it would stretch below its long term trend in order to indicate to us a ripe time to go long the market. While valid, the problem with the signal that I suggested back in March 2009 is that it is difficult to tell exactly when we’ve hit “extreme”. As with the recent behavior of the volatility index (VIX) it is clear that although an indicator can set a certain range for a long time, in the blink of an eye, you are presented with an outlier. In such a situation, what was once considered the shore becomes very deep water indeed. Since I prefer the Standard’s & Poors 500 index, I decided to take a look at its historical performance using the same criteria from 1950 to today. 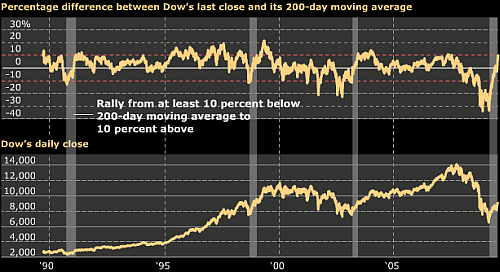 First, I recorded when the percentage distance from the simple 200 moving average fell under -10%. And then when it rose above +10%, I walked forward 3 time frames, 90 trading days, 180 trading days and 265 trading days to find out how the market performed. I realize that the above article from Bloomberg is probably using regular calendar days not trading days but I don’t think that is a material difference. 180 days later: ?% higher? 365 days later: ?% higher? As you can see, the S&P 500 provides for an even more impressive track record than the Dow Jones (although with fewer examples). In fact, for every single instance and for every single time frame going forward, you would have made money. By the way, with today’s close, the S&P 500 is now trading 13.21% above its 200 simple moving average. Seems like a relatively low sample size from which to be basing investment decisions. I agree. Too many are using data points from past business cycle recessions. This is a credit recession. Apples and oranges. Mihai, those are interesting data points. -13% is not too scary; I wouldn’t buy LEAP puts if I thought that was the worst-case downside a year out, for example. Charts haven’t changed that much in 80 years. There will always be somebody trading the moving averages, whether trading apples or oranges. Do the study for 1929 crash and you could see a 37.18% by the summer of 1933 with a caveat of initial draw down around the first 180 days. Mihai, the study using the Dow does go back that far.